The Bay Breeze Resort, located in beautiful Ephraim, sits right across the waters of Green Bay and Eagle Harbor. And Ephraim itself is a delightful town, with Wilson's Restaurant, unique shops, and the Hanseatic Gallery all in town. There is a real mom and pop feeling to this resort, and it’s because of the spirit and attention to detail that Debbie and Gary Krause (the innkeepers and owners), and their staff display. This makes guests feel comfortable, welcomed, and coming back! Just past the front porch swing, you walk into the small lobby to check in, and you immediately feel comfortable amidst the beautiful photos for sale, some t-shirts, and other items. A couch convenient for waiting, a small cabinet and other niceties welcome you. We met with Debbie and took a tour of the resort for more than an hour. Awaiting guests, nestled in between the two sections of the L-shaped resort, is a nice size outdoor, heated swimming pool and hot tub, offering a pleasant view of the waters in the harbor, while you enjoy the fresh outdoors. A nice footbridge across a thick foliage garden leads the way to some of the rooms and suites, while the sidewalk on the side of the pool bursts with colorful flowers. Quite a pleasant surrounding for the pool area! The landscaping is meticulously done and very well maintained. In addition to the pool area, beach access for Bay Breeze guests is right across the road. This 24 room family resort welcomes children, but no pets, please! With a combination of single rooms and suites, we toured samples of each, and were very impressed with the impeccable cleanliness of the Bay Breeze and the overall feeling of the room. Nice touches in the rooms and suites like stenciling near the ceilings, dried flower arrangements on the walls, floral bedspreads and other niceties make the Bay Breeze a breeze to select. 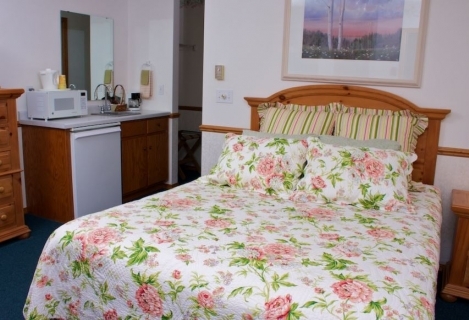 The deluxe single room is a nice size room and is complete with a refrigerator for snacks and drinks, a wet bar, microwave, cable TV, telephone, air conditioning, and coffeemaker -lots of nice conveniences for a couple or a family. The queen bed has a pine Broyhill-type headboard and matching nightstand. A circular table and four chairs completes the room, offering a nice place to have a snack, read a magazine or just relax. The luxury suites contain all of the single room niceties, but with a king bed, a living room with table and chairs, fireplace, sofa and coffee table. While trees in bloom do block some of the actual water view, you can still see the water, which adds a peaceful element. And Ephraim is one of the best towns in Door County for glorious sunset watching, making a nice evening treat! Debbie and Gary also have a couple of cottages for rent as well, the Birch Valley Hideaway (in Fish Creek), and the Bay View Lodge (in Fish Creek) -both 3 bedrooms, and rent-able by the week in-season, and by the day off-season. We did not tour these cottages, but the photos looked fabulous. For more details, visit the Bay Breeze website at www.BayBreezeResort.com! And always check with the innkeeper for current rates, but rooms and suites rates are very reasonable and can vary depending on room, or type of suite and season. Always check with the inn for current rates. Built in 1995, the Bay Breeze is a great escape in a wonderful Door County town! We know you will love this place and the folks who run it, so please tell them that DoorCountyNavigator.com sent you!